Late last year when the powers that be at the iconic Carr & Day and Martin got in touch with me and asked if I would be interested in testing and reviewing their revolutionary Equimist 360 spray bottle filled with the old time favourite, Mane and Tail Conditioner and Canter Coat Shine I jumped at the chance. You can find out how I got on by clicking here. Ceaser and I had so much fun posing for photos and writing up the review that when the lovely Laura from Carr & Day and Martin got in touch again to ask if I would consider testing their Hoof Care Range for 12 months I immediately agreed. Who wouldn't jump at the opportunity to work with such an influential and much-loved company? Okay, so lets go through the products and what i'll be looking out for over the next 12 months. To begin with Laura and I spent a considerable amount of time on the phone discussing where my blog was heading for 2015, what my plans were and why Ceaser was the "face of it all". We discussed the option of testing all of the products on him, but apart from losing the odd shoe here and there his feet have always been rock solid and quite good. As a baby he would often get sand cracks but since being permanently shod on all four feet that hasn't been a problem. Of course this then got me talking about Ziggy. When he arrived with me back in March 2014 he was shod in front but his feet were in a shocking state. They were long, cracked and how he hadn't lost a shoe I really don't know! Since then my fantastic farrier Paul Scott (Google him if you're in Lincolnshire, he's great with all types of horses and very knowledgeable) has worked tirelessly to get Ziggy's feet in better shape. We took his front shoes off (I'm not a big believer in 4-year-olds needing shoes) and he's just been trimmed regularly ever since. 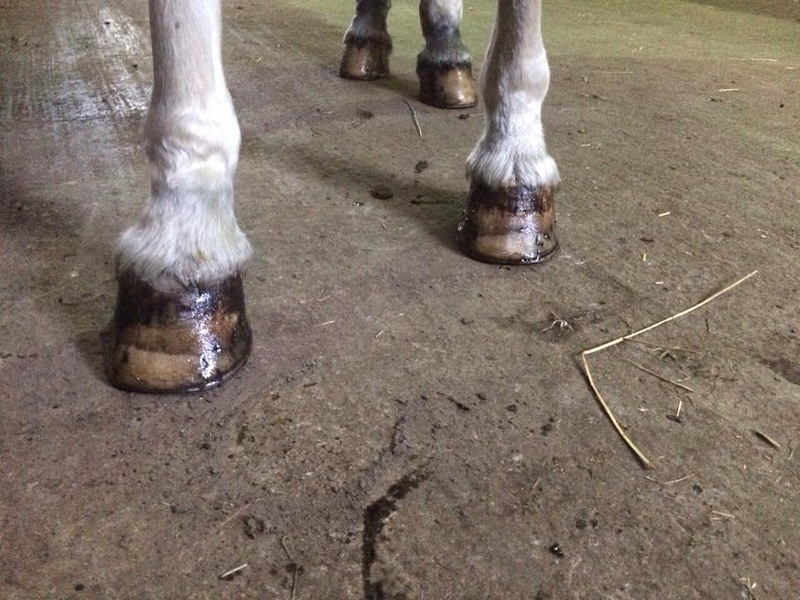 Although his feet looks ten times better than what they did they still crack when he's due a trim and get quite brittle, so Laura suggested trying the Hoof Care Range with him and seeing what results we get. I'm already an avid user of the ye' olde' Carr & Day & Martin Hoof Oil in the instantly recognisable red tin, so although Ziggy will be having the supplement to go alongside the ointments and oil, Ceaser will also be using these but without the supplement. The plan going forward is to photograph both ponies feet fortnightly and see what difference we notice and if there are any noticeable changes. Although signs of improvement may not be noticeable immediately, we are hoping to see some difference by capturing regular photographs and videos over a significant period of time. You should all know by now too that I don't do things by halves and for some time now I've been toying with the idea of Vlogging, so the plan is to not just blog fortnightly but also Vlog and add some fun into all this. I'm not good in front of a video camera and to practice for this Mark and I have been filming silly clips when we've been out and about. If I could put all the out takes together I would, but I don't think either of us would live it down. Filming the first scene couldn't have gotten off to a better start as Ceaser almost knocked me flying because standing still to look pretty for a video was just too much hassle! Anyway more on that later, it's product introduction time! After our chat Laura asked me what my fields were like and how much time Ceaser and Ziggy spent indoors in their stable. Both spend probably on average 3 out of 7 days outside at the moment, but as soon as the lighter nights and warmer days make an appearance this will increase a significant amount. However, for now we decided to protect against wet, muddy fields and deep littered beds. There really is a product for everything in the CDM range! At Carr & Day & Martin they have developed a 3-step, individually tailored approach to create healthy hoof growth and then protect and maintain that growth. Individual horse-owners wanting to follow this regime will like me need to pick the Daily Supplement and Hoof Ointment, but then will pick their third step from a variety of daily routine products varying from Tea Tree Hoof Oil to Daily Hoof Moisturiser and so on. There are four daily products in the range and each focus on a different speciality area including an oil for dry conditions and one containing anti-bacterial agents. If you're unsure which one to go for I would really recommend contacting Laura or one of the other CDM team members who will be able to help you. Their optimum strength supplement will help to combat nutritional deficiencies and support hoof growth, strength and condition. Cornucrescine Daily Hoof Supplement is a highly palatable pelleted formula that is ideal for all horses. It contains numerous proven ingredients to encourage and help the body to produce healthy and strong hoof growth. You can feed the supplement daily, by hand as a treat or by adding to the ration. New healthy hoof growth should be evident within as little as 3 months so I'm really keen get started on using this supplement. It will just be Ziggy using this as he's the one needing the most help with his hooves! Massaging the famous Carr & Day & Martin Ointment into the coronary band provides essential nutrients and will stimulate new, quicker, healthier growth. This process encourages the production of keratin by increasing blood flow to the coronary band and providing the nutrients to assist new growth. This is especially important for those who have existing hoof problems such as cracks that need growing out. Cornucrescine Hoof Ointment has been used and trusted since 1896 to promote healthy hoof at the coronary source. When used weekly the ointment maintains healthy hoof growth, when used daily it helps accelerate this growth and improve hoof quality. Both Ceaser and Ziggy (more than likely Sara too!) will be having this on three times a week. Finally Carr & Day & Martin are keen to promote managing the environmental conditions that affect the hoof wall, ensuring it can maintain its’ strength and durability, all year round. 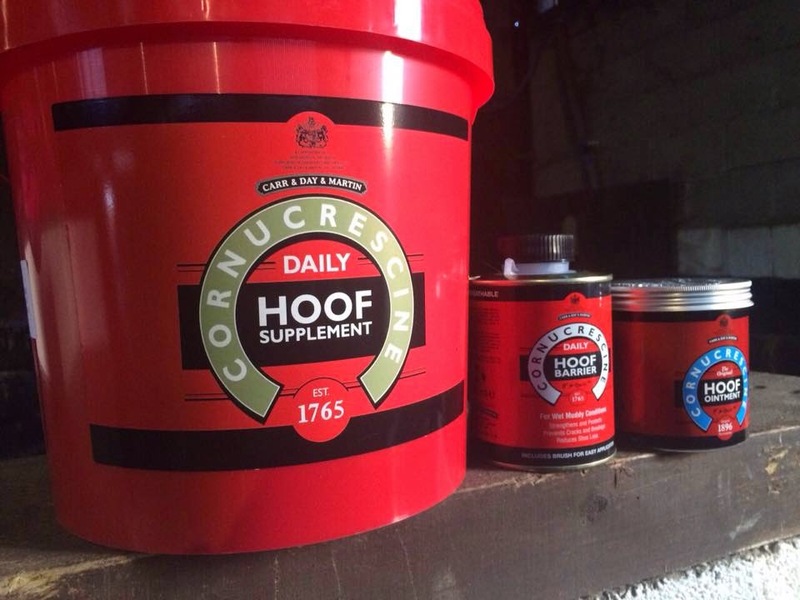 The Cornucrescine Daily Range gives horse owners the ability to tailor their hoof care routine to their horses’ requirements. 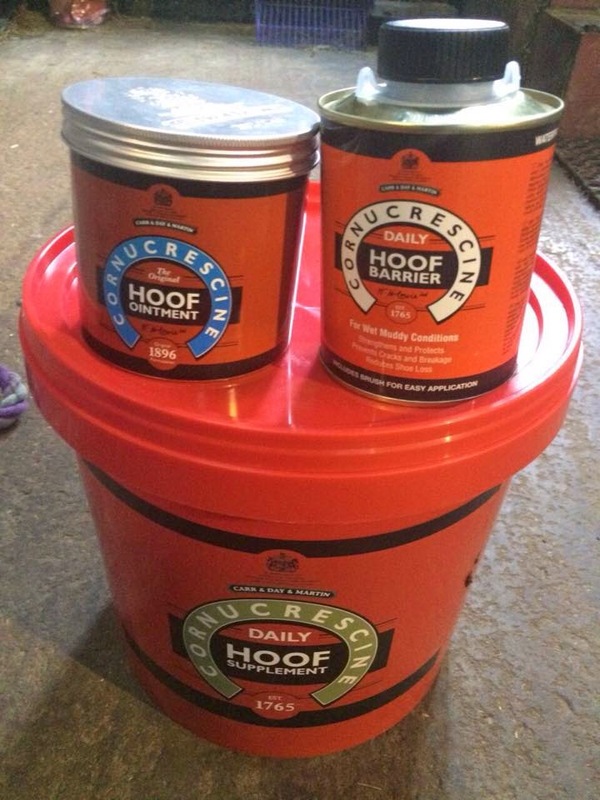 Choose from Hoof Dressing to nourish the hoof; Hoof Moisturiser to combat dry and brittle hooves; Hoof Barrier to prevent waterlogging; or Tea Tree Hoof Oil to protect from infection and give a long lasting shine. This flexibility allows hoof care regimes to be tailored to suit every individual horse and the environment in which it lives. For now Laura has sent me the Barrier as our step 3 product, as it is perfect at this time of year. It creates a one way barrier that prevents the hoof from absorbing excessive moisture, ammonia and urea. The advanced formulation waterproofs but still remains breathable, allowing any excess moisture to be expelled. This helps to strengthen, support and improve shoe retention. It also contains an antibacterial agent to protect the horn. So if your horse, like Ziggy, Ceaser and Sara, is out in muddy, wet conditions it keeps the hoof strong and equally, if your horse is in on bedding a lot it stops the ammonia in the urine from eating the sole. Initially I was worried about giving Ziggy the Hoof Supplement as he can be a fussy eater, but thankfully rather than being a power formula like other supplements they're small pellets that both look and smell like feed, making them very palatable and tasty! From now on every fortnight i'll be updating this blog taking you through a series of pictures and videos showing just how both boys feet are getting on using the Carr & Day & Martin range. To find out more about the Carr & Day & Martin range and their sister site Day Son & Hewitt visit their website now! Both Ceaser and Ziggy had a trim and in Ceaser's case a new set of shoes the previous week. I'll be posting pictures and an update in the next few days, keep an eye out for it going live! Ribbons in a horses tail. What do all the different colours mean? "Give me that mud fever, mud fever! We know how to solve it!" Mud fever - How to deal with it and how to cope! Clipping for the winter - Do I or don't I. You decide. The brand new......HYPOCARE from Horseware. "I don't have an endless money tree that grows more notes as I pluck others off"
Equine Reiki in Lincolnshire, by Jane Hunt. "Hunting and Dressage in one weekend? You must be mad!" © [Sian Lovatt] and [Sian Lovatt Equestrian and Journalism], . . Powered by Blogger. © Sian Lovatt - Country Bumpkin. All rights reserved.